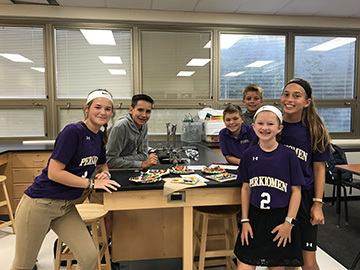 Perkiomen students are engaged in creative thinking and collaborative learning. Here's a glimpse into what is happening in our classrooms this month. 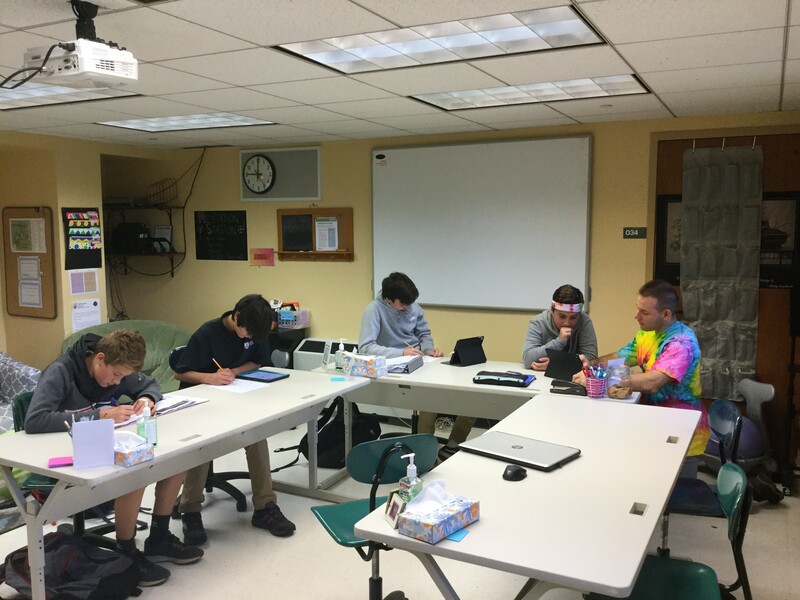 Mrs. Hackett’s ENG-6300 class read Alex Gino’s novel titled George which was read by the members of the Windows & Mirrors Book Club. 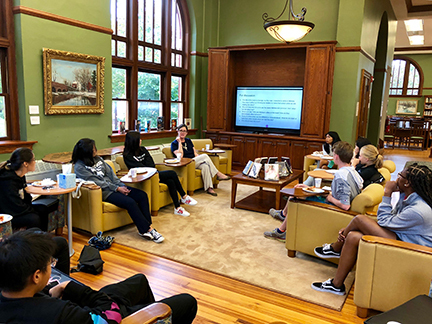 Last week, the students joined the book club members for a luncheon and discussion about the book. The gathering was hosted by Ms. Hammond in our beautiful Carnegie Library. During the event, students watched a video about the author and exchanged their opinions about the book and its main characters. Profa. 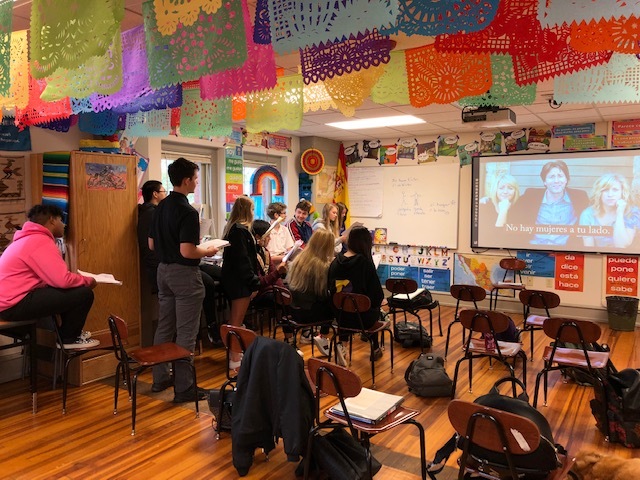 Dinsmore’s Spanish II class is working with the Señor Wooly video Guapo. The Señor Wooly platform provides students with catchy songs, live and animated videos, fun activities, and even homework activities to give the students repetition with the structures presented in the song. As there is no grammar per se, students learn through context. One can hear Señor Wooly songs being sung all over campus! In this video, students learn how to describe people. While Srta. Flores was away celebrating her wedding, her classes were working on projects. Spanish II B are creating Halloween costumes in Spanish and preparing their presentations. In Mr. Sell's 7th grade class has been reading The Outsiders. One of the main themes that discussed was stereotypes, and how they affect Pony Boy and the other Greasers. Mr. Sell posted 15 signs indicating different groups around the room that the students could have identified with, such as Baseball Player, Singer, and Artist. The students then walked around the room and stood by the group they associated with the most. The groups then had discussions about stereotypes that others had about them, as well as the realities. This lead to strong discussions about their groups, and how negative stereotypes can be. To close, the groups talked about which groups may get along, and which groups did not have a lot in common. 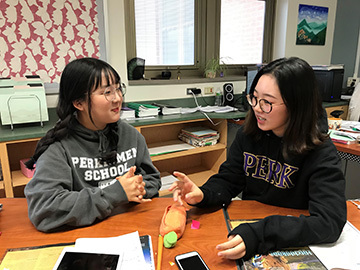 Currently in AP Language and Composition students have been experimenting with scholarly discourse through an activity known as a Socratic Seminar. The experience is student led where groups are assigned certain questions that address the rhetorical strategies of the studied text. This week we are reading an unusual, essay titled, Dumpster Diving by Lars Eighner. The author spent a year off the grid in the late 1990s living completely out of dumpsters. The article is meant to be a clinical guide of how to live off the societal waste and to get the reader to look at themselves. Student leaders and participants did an exceptional job in keeping the conversation focused, analytical, yet weaving in their own opinions and experiences. This is excellent practice for the AP exam, as well as preparing them for college. All decked out in enthusiastic support of Tie-Dye Day for Perkiomen’s Spirit Week, our new Learning Specialist in The Learning Center (TLC) is helping students work through a few algebra problems. 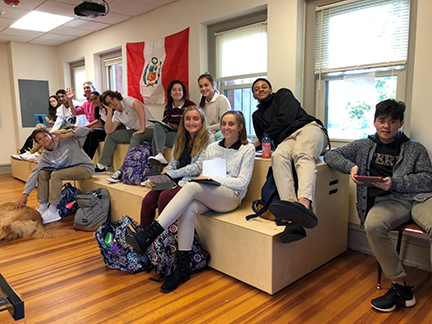 Each day in TLC, Mr. Lees introduces the class to a new academic skill to ensure they are cultivating a toolbox of strategies that nurture cognitive flexibility and concept mastery. Following the daily lesson, students receive individualized support on a particular task in any of their major subject areas. The staff and students comprising the TLC community all work collaboratively to develop their strengths and share their enthusiasm and ongoing curiosity for learning! In Mr. Hyatt's engineering class students had the goal of building a skyscraper from spaghetti, glue, and tape to withstand an earthquake for 10 seconds while supporting an egg at the top. They had to keep track of their budget, as well. A Jell-O base served as the earth and the foundation of the building, with a reciprocating saw moving the spring table to simulate the motion of an earthquake. Special thanks to the Delp family for loaning their reciprocating saw to the class. The Upper School Band is working on some new music. We are excited to dive into some new titles and challenge our musicianship skills! 7th grade students standing with their models of the cell using PopTarts, icing, and candy. 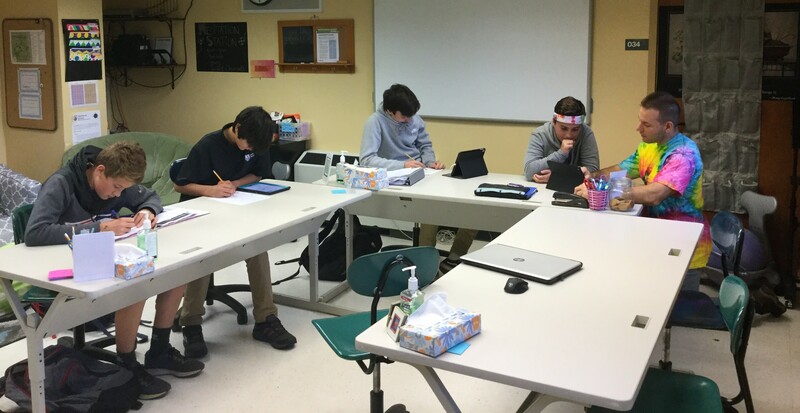 Students in Ms. Maley’s English Language class practiced skills like skimming, using phrasal verbs and identifying evidence as they read an article related to hitchhiking. Later they were tasked with creating a story of their own about hitchhiking. Here two students are working with their partners to create their story. Later they will compete to see which partnership is able to create the best story using target vocabulary. Students in Ms. Seiler’s English Language classes were introduced to an engaging vocabulary review game this week: Castle Attack! 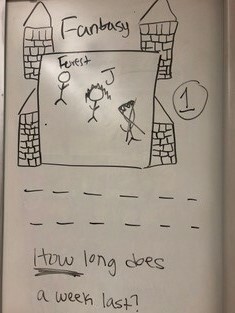 In this game, each team displays an original character (stick figure) of their choice in their castle which is displayed on the whiteboard. As review questions are answered correctly, team members decide whether to attack, i.e. erase a wall of an opponent’s castle, or build, i.e. construct an additional wall around their castle for added protection. When a team’s final castle wall comes tumbling down, i.e. erased, the team that made the successful attack takes the character hostage. The game, which involves both strategy and a fun review of important terms, ends when one team has taken all of their opponents’ characters hostage.